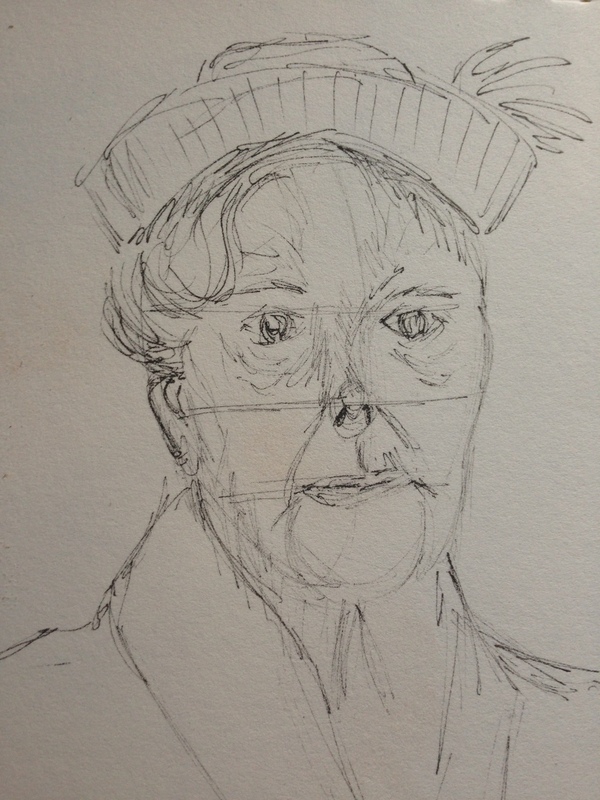 The aim, according to Joy, is not to achieve a likeness in five minutes, but instead, to prepare for a longer study or, in her case, a commissioned portrait. Once I got used to the steps and process, it was actually a lot of fun! I think it’d be easy to get hooked if you’re interested in drawing people. And I do believe it is sharpening my drawing skills, so in my opinion, it was worthwhile. Joy also wrote a book, which I’ve borrowed from the library entitled “The Art of Portrait Drawing: Learn the Essential Techniques of the Masters”, which can be found here. This one ^^ was closer to six minutes, by the time I drew in her hat and coat. But I’m definitely interested in doing more of these. As the author says, once you get used to the method, it’s amazing what you can do if you draw it out to twenty minutes….or even ten. I’d also like to learn to do pet portraits (which Thomas does as well), but I have a feeling that will be much more difficult. I love animals, but I don’t find fur the easiest thing to draw. Maybe if I could master the fineliner pen! Can’t believe it’s Wednesday already! Counting down to fall foliage! 😀 Peace. Maybe you could draw furless animals. The sphynx cat, or the mole rat. 😉 I bet not many people draw mole rats, the poor little things. I am quite amazed that those portraits took you five minutes. Now that’s impressive. Maybe you could go down to the high-street or library and draw people you see there. You could charge people a dollar for a picture if they want to keep it. Good idea, furless animals lol! I’ve tried drawing people at the library. I should try again, I think if I got a better seat I’d feel less obvious. Before I was obsessed with art, I think it’d kind of creep me out if I saw someone in the library and knew they were drawing me. Would that be creepy to you? I don’t know. Maybe not once i find out they were only drawing me! I think in libraries, well at least for me anyway, i don’t really notice what other people are doing so probably wouldn’t see if someone was drawing my portrait. I’ve done quick figure sketches in libraries but portraits would be harder because you need good lighting and a closer distance. It’s a thought, it just feels like I’m doing something wrong lol. Very impressive portraits Laura! I do like them…You are so advanced now! Thanks so much, Johanna! We’ll look forward to fall together. :))) I really need to learn to paint/draw trees though, because I know I’ll want to do lots of that. Maybe with ink and watercolor. 😊 Thanks for your encouragement. Lol thanks Jodi! So much junk rattling around up there, maybe I should have a rummage sale. 😊😀😝 Have a great Wednesday! I’ve tried 5 minute studies before when I took an art class in high school! I should try it again. My studies are either much shorter or much longer. I’d say that my Arnold drawing probably took a total of 10-15 minutes because I could only draw as he was on screen (and could only do a few strokes at a time as he was constantly moving). 🙂 Thanks for the book recommendation! p.s. great job on your studies! They are so addictive, Teresa! I’m not sure if the book mentions the 5-min studies, it’s a more in-depth work about portraits, but they really are fun to do! I love portraits! I had wanted to be a portrait artist (not too late to start, I guess). I love reading analyses of how to do them properly. Definitely not too late! I’ve been thinking the same thing. Wouldn’t it be cool to do people and pet portraits. Idk. I start to wonder if I’m having a midlife crisis or something but for some reason, portraits do call to me. Well, along with watercolor and so many other things, I’m a little art ADD lol. Wouldn’t it be cool if you wrote and illustrated a book for kids, then you could offer a quick portrait to a “lucky winner” at your book signings! Hehe! Or maybe one of your characters could draw other animal portraits. 💛 You definitely have a knack for it! That video was very inspiring. It’ll happen. I have faith in your talent, imagination and persistence, Teresa!! Hi Laura – It’s amazing what a quick few lines can bring about. Thanks for sharing your sketch work. This is a great idea! I think there’s something to be said for trying to work quickly sometimes – maybe it helps you see the bigger picture rather than getting too focused on the details. Good job on these! Thank you! Yes, definitely try it! Really helps me to focus on the essence. I think even for someone with no interest in portraits, getting the essence down is still key. I’ll give it a shot at some point! You inspire me. Downton Abbey characters perhaps? These are great!! I need to try this Laura! Might help me get over my fear of drawing people! Hehe… I’ll definitely check it out. Thanks for posting the info! You’re quite welcome, Charlie! Understand drawing real life people – strangers – I think we’re the same. I would want to get someone’s permission, particularly if I don’t know them. But to draw people from the TV or photos – do you have the same issue? I was afraid to try people too until I went to Open Studio and they had a model. The first one, I worked with the project I brought instead, but the second one, I thought I would try. Wound up loving it! I hadn’t tried drawing people since high school (didn’t work out back then), but for some reason it worked better after many years passed. Maybe it’s a hard lines/soft lines thing again. You are really good at buildings but I am bad at perspective so I tend to shy away. I feel like birds, flowers, people, the soft lines, are better for me. But I don’t see why we can’t cross back and forth. One thing that has really been good for me with my soft lines work is Polychromos colored pencils and the Hand Book and Stonehenge papers. The Strathmore mixed media journal, also excellent. I’ve found sometimes that the key is combining the right medium, paper and subject together. Not sure if that helps, but I hope you give it a try. Drawing portraits too Laura – this is pretty incredible. I do like your five-minute portraits, each piece has character and interest. Very cool ~ looking forward to more. Wow! 6 minutes is fantastic. They look great. I think I even recognize the top female character. 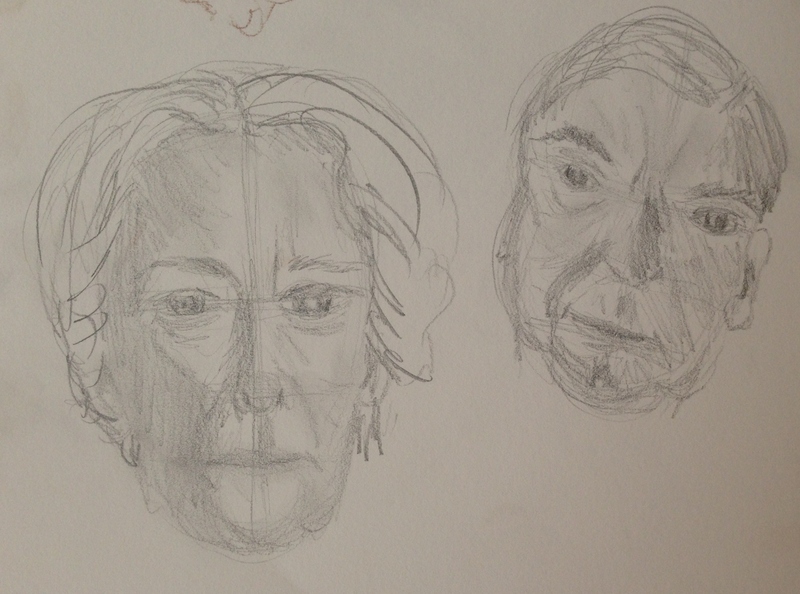 I tried drawing faces some years back, but nothing stuck. I can’ t draw them without the book in front of me guiding me through it. I wonder if I’ll ever be able to put what I see in my mind’s eye on canvas/paper? I can’t even tell you how many times I’ve wondered the same thing! I think we all struggle with this. Hopefully, persistence pays off. These are so good and in 6 minutes. You have such a good eye. I hope you continue with portraits. Thanks, Carmel. That means a lot, coming from you! Have you ever focused on just the face? I love your selfies! Thanks! Her method really helped me.